As an HR director, there’s only so much you can do to protect your employees and your company from avoidable risk. You can create an engaging workplace safety manual. You can run a few fun team-building exercises that tout the benefits of health and safety compliance. And while every new hire may dutifully sign their paperwork acknowledging that they’ve read all of the employee safety guidelines, you’re well aware that there’s a good chance that at least some of those eager new workers may have only skimmed a page or two. With a 7% uptick in workplace accidents during the past two years, the stakes for your workers (and your company) are exceptionally high: those glossed over pages on safety compliance may haunt your efforts to manage employee risk over time. That’s why two of your most important duties—keeping your workers safe and limiting your company’s exposure to liabilities—can’t be left to a handbook, bulk emails, and your valiant efforts to hold your employees’ attention during a new hire orientation. Instituting a company safety program is one of the most efficient ways to limit employee risk, but this can do more harm than good if the program fails to engage your workers. That means the structure of your company safety program—from hazard communications to safety compliance education—has to be rock-solid: intuitive, user-friendly for learners, and built on a platform that can accommodate the unique learning styles of your employees effortlessly. 1. It makes safety compliance principles tangible for employees, transforming your handbook into experiential learning that sticks. For the past 30 years, leading educational theorists and neuroscientists have used technologies such as positron emission tomography (PET) and functional magnetic resonance imaging (fMRI) which scan brain activity to delve into the mysteries of how humans best acquire and retain new knowledge. The consensus? Experiential learning that requires active participation (which can include interactive learning experiences such as self-directed learning through a learning management system (LMS)) is more impactful for students than just sitting and listening to a lecture—or reading a manual. An employee safety educational program, anchored to an interactivity-focused course can help your employees to acquire and critical safety compliance knowledge more easily and retain it longer. Learn about Learning Management Platforms. 2. Your employees can be held accountable to acquire and consistently demonstrate safety compliance knowledge. Employees participating in an LMS-based employee safety program will frequently exercise their understanding of compliance procedures via course assessments during the initial on-boarding process, and then over time and on-demand through continuing compliance education activities. During self-directed learning via an LMS, one of the key neurological hindrances to knowledge retention—repetitive, performance-focused stress—is eliminated for the employee, allowing them to acquire critical safety compliance knowledge at a pace that matches their learning style. 3. It can add order to what can sometimes be a chaotic new worker on-boarding process, creating a single standard for employee safety compliance training across all departments. While every department may have a separate culture when it comes to compliance communications, an employee safety program can ensure that all teams are on the same page. An LMS gives all employees equal access to the information that they need to stay compliant with current risk management guidelines while providing team leaders with a real-time snapshot of their team members’ strengths and weaknesses in safety compliance knowledge. 4. An LMS-based employee safety program allows you to identify and provide support to team members who may present safety risks based on poor performance on learner assessments. Employees with poor knowledge retention after their safety compliance training will require additional support. If you are using WestNet, your LMS curriculum content can be updated quickly in response to discovered employee knowledge gaps, and supplemental course modules can be presented to individual learners or globally as needed. 5. It can simplify Occupational Health and Safety Health Administration (OSHA) compliance activities. Regardless of the scope of your OSHA-mandated compliance training responsibilities, an LMS-based employee training program can streamline your efforts to maintain—and exceed—OSHA standards. Whether it’s fulfilling hazard communication requirements or merely ensuring that the language used to communicate safety guidelines is clear to your entire workforce, the right LMS will present pertinent information in full and consistently track user interactions with the material. WestNet provides HR directors with an effortless way to quickly assess employee safety compliance knowledge gaps and address them with customizable, outcomes-focused training. Even if you are only just now beginning to think about creating a company safety program, you get started straight away with our LMS. Although it scales effortlessly, WestNet MLP LMS provides everything that you need to create, launch, and manage a full-featured company safety education program from day one. 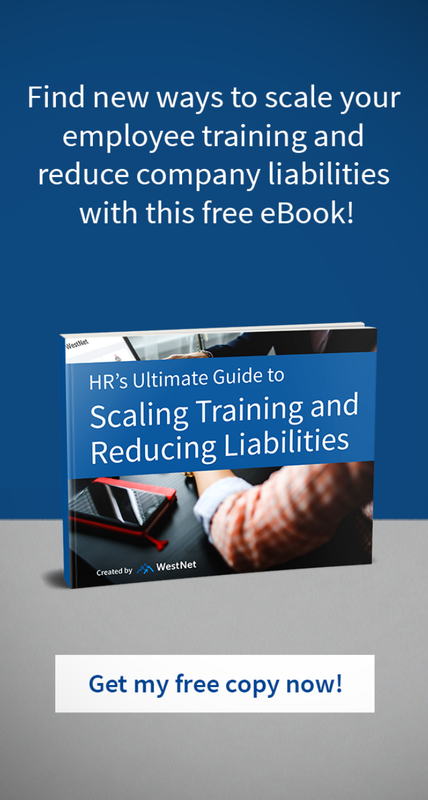 It’s designed to allow HR directors to optimize employee learning and performance from a single platform, providing all of the course creation, management, and analytics tools needed to meet the demands of a growing workforce. WestNet Learning is a cost-effective LMS service, specifically designed for scaling business training, safety, and management needs since 1996. No matter the size of the company, WestNet Learning provides an easy-to-use platform, utilizing the latest technology for Human Resource professionals that strive to ensure their employees safety program and prevent company liabilities. If you would like to learn more safety tips, or learn more about how an LMS could help you improve your employee safety program, schedule a 1-on-1 strategy talk today.